FILE - Israeli Prime Minister Benjamin Netanyahu calls for scrapping a U.N. inquiry into alleged war crimes by his country in Gaza last summer. A United Nations inquiry into possible war crimes committed last year in Gaza will proceed, despite the resignation of its chairman and despite protests from Israeli Prime Minister Benjamin Netanyahu. Mary McGowan Davis, a member of the independent commission of inquiry on Gaza, will replace former chief William Schabas, a U.N. statement said Tuesday. Schabas submitted his resignation Monday night after an Israeli complaint accused him of bias because of consultant work he did with the Palestinian Liberation Organization. Israeli Prime Minister Benjamin Netanyanhu on Tuesday called for scrapping the probe. William Schabas on Monday evening had submitted his resignation as leader of a three-member commission charged with investigating whether Israel committed war crimes during last summer’s conflict in Gaza. The commission, set up last August by the Geneva-based U.N. Human Rights Council, is scheduled to issue a final report March 23. FILE – William Schabas, in ribbons at center, has resigned as head of a commission examining alleged war crimes during last summer’s Gaza conflict. 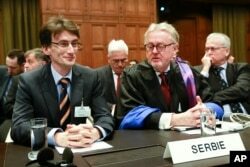 Here, he’s shown at The Hague’s International Court of Justice as part of a Serbian delegation in March 2014. Netanyahu on Tuesday called the commission an "anti-Israeli body" and said its investigation should be abandoned. Israel had refused to cooperate with the inquiry. Schabas, an academic and outspoken critic of Israel, had faced pressure since that country formally accused him January 30 of "clear and documented bias," noting his previous "contractual relationship with the Palestinian side." News media reviewed Schabas’ resignation letter and reported he acknowledged receiving $1,300 for a legal opinion he wrote in 2012 for the Palestine Liberation Organization (PLO). It was of a "technical legal nature" based on his scholarly writings, Schabas wrote. He further explained his decision to resign, telling Israel Radio he was "becoming an obstacle and a distraction to the work of the commission. So I had to get out of the way and let it get on with its work so it can prepare its report." Schabas’ resignation comes weeks after prosecutors at The Hague’s International Criminal Court announced they’d begun a preliminary inquiry into alleged atrocities in the Palestinian territories. During the 50-day Gaza conflict between Israel and the Islamic militant group Hamas, more than 2,200 Palestinians and 72 Israelis were killed. The U.N. said two-thirds of the Palestinian casualties were civilians. Israel denies allegations of war crimes, saying that it was acting in legitimate self-defense against Palestinian rocket attacks and that Hamas used civilians as human shields. Netanyahu said Hamas, not Israel, should be investigated for war crimes. The prime minister disparaged the U.N. rights council, saying that last year it "made more decisions against Israel than against Iran, Syria and North Korea combined." The Associated Press reported the council has passed more resolutions condemning Israel’s alleged abuses than those of other states. The council’s 47 members include several Arab and Muslim-majority countries. Palestinian officials expressed disappointment over Schabas’ decision to step down. They said Israel seeks to intimidate and discredit anyone who tries to hold it accountable for war crimes. U.N. officials said that despite Schabas’ resignation, the commission’s report would be presented as scheduled. The commission has nearly completed compiling evidence and has begun writing. Some information for this report came from The Associated Press and Reuters.